Circle the wagons as the Jaguar XF Sportbrake has arrived. 2018 Jaguar XF Sportbrake S AWD. 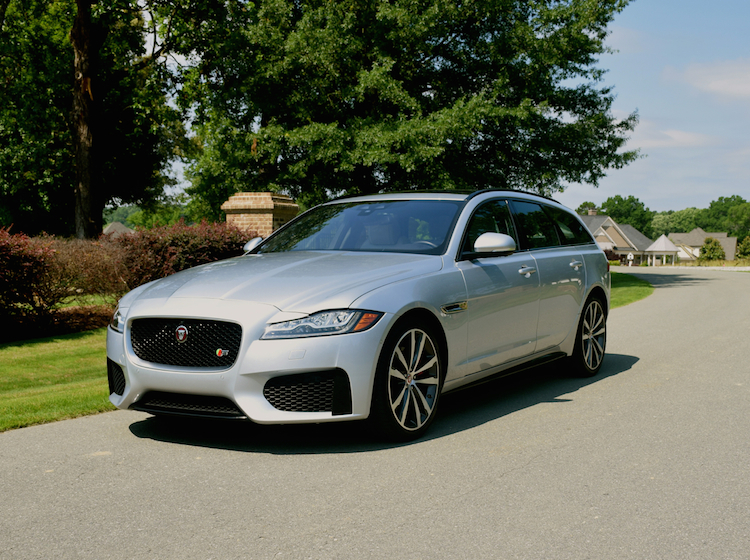 The 2018 Jaguar XF Sportbrake is a midsize luxury wagon, a model that joins the existing XF sedan. Jaguar’s new model blends the best of a sedan with a crossover, giving customers a fresh choice in the luxury sphere. The XF Sportbrake’s fetching design may make you rethink everything you had thought wagons represented. If it does, then that is a good thing. Wagons are not new to Europe, which has long embraced them. Once popular in the U.S., wagons were largely dropped from vehicle lineups in favor of minivans. Down through the years, we have seen such models as the Dodge Magnum and Cadillac CTS sport wagon appear briefly, then disappear. Most recently, this writer reviewed the Buick Regal TourX, the first wagon for the Buick brand in decades. But Jaguar occupies the top-tier of the market and that is where the new XF Sportbrake competes. Yet, it does not occupy the segment alone as Volvo offers two models: the V60 and V90. You will also find the BMW 3 Series and the Mercedes-Benz E-Class with wagon variants. In the mainstream sphere, the Volkswagen Golf SportWagen also holds sway. If you are shopping for a midsize luxury wagon, then the Mercedes-Benz E-Class and either Volvo model are Jaguar’s logical competitors. Typically, Jaguar offers multiple trim levels and powertrain choices with its vehicles. You will find a wide range of models, ranging from standard to top-end luxury. 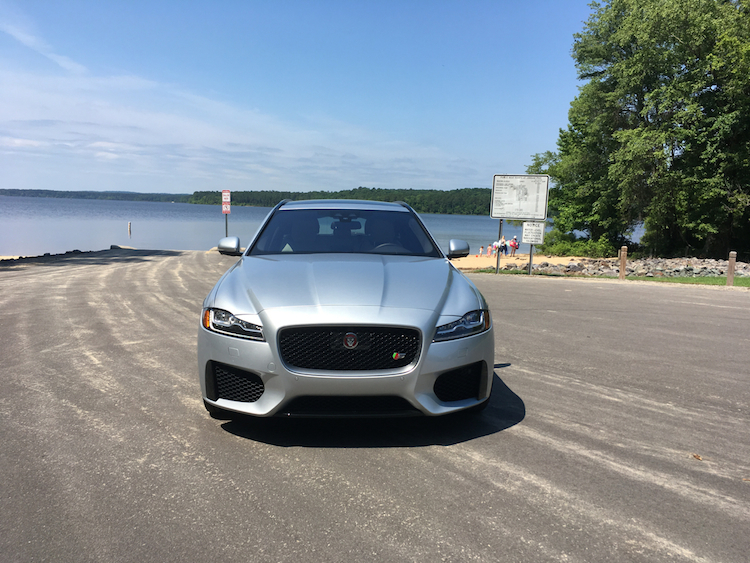 The 2018 Jaguar XF Sportbrake offers a clean departure from that approach. Here, there is only one trim level, plus a limited-edition First Edition model. Jaguar must know that wagons have limited appeal in the states, so instead of offering a wide range, this British automaker elected to go with one that is likely to deliver maximum appeal. So, your choice for 2018 is the XF Sportbrake S ($70,450) or the XF Sportbrake First Edition ($72,100). Add $995 for your destination charge. This wagon seats five, has standard all-wheel drive, a supercharged V6 engine and an automatic transmission. A quick scan of the XF Sportbrake reveals an interesting combination of expected and surprising features. From the front fascia to the edge of the windshield, the look is all XF sedan. From the canted windshield and stretching all the way to the back, the design features a fresh take all its own. And that extended look features a long, sweeping roofline, which tapers from the B-pillar to the rear, ending in a liftgate that juts out and down. The spoiler adds a fitting separation between the roof and the rear. An even beltline, pretty character lines, subdued body sculpting and just the right amount of ornamentation add flair. The 20-inch sport wheels with red brake caliper covers serve as eye candy. At the rear, the requisite polished chrome dual exhaust tips complete the experience. Inside, the cabin offers the beauty, fit, finish and layout you expect with Jaguar. 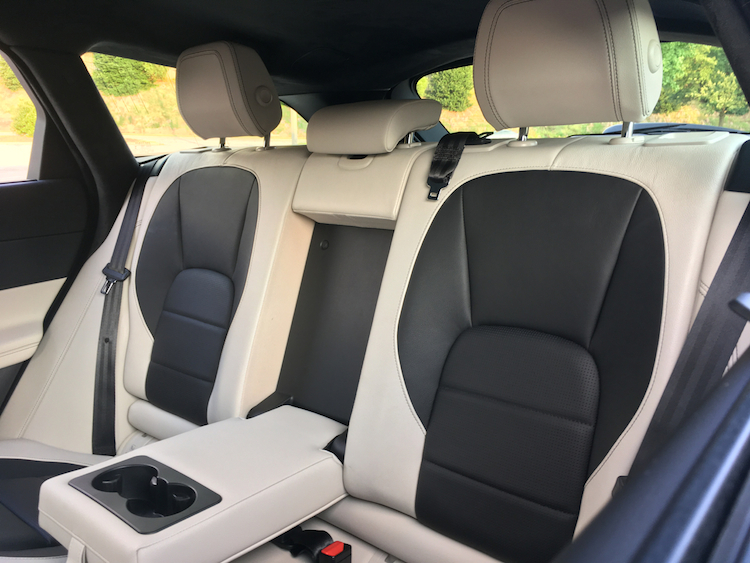 The interior is dressed in leather with twin-stitching running across the dashboard, the door handles and along the edges of the seats and headrests. Aluminum controls and carbon fiber touches add visual interest. Jaguar models typically make use of smart color combinations and my test model offered a rich example of this with Oyster and Ebony the chosen colors. 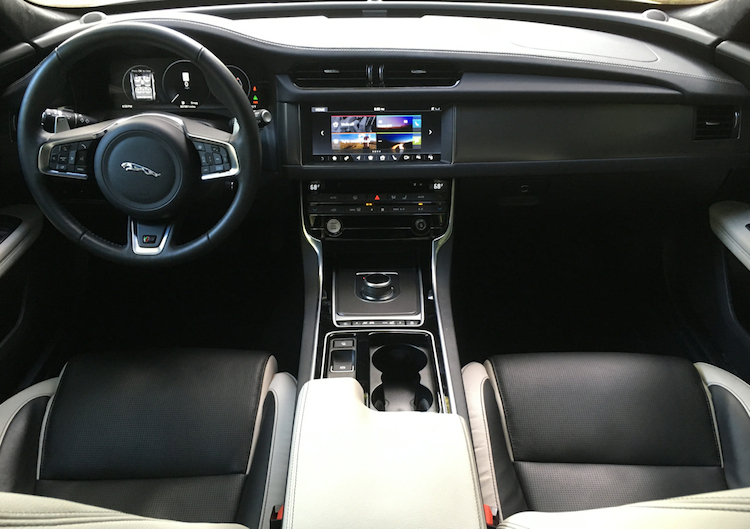 Jaguar supplies a thickly padded steering wheel, a digital dashboard and a cleanly laid out center console. Turn the XF Sportbrake on and the transmission dial emerges. Behind the dial is a place to park your smartphone. Ahead of the dial is two cup holders and a small storage compartment. All four doors have storage pockets as well. Seating is for five and all five will fit just fine. Storage space behind the second-row seat measures 31.7 cubic feet. Fold the seat and you have nearly 70 cubic feet to play with. Yes, that space is longer and shallower than your typical crossover, but it offers usable space that should intrigue anyone who might otherwise prefer a crossover. Because the XF Sportbrake comes in one well-equipped trim, you will find the expected driver-assist features bundled in one package ($3,495). You get blind spot detection with reverse traffic detection, adaptive cruise control with queue assist, and park assist with a surround view camera. Jaguar supplies this model with an eight-inch capacitive touch-screen. There is a Meridian audio system along with satellite radio, USB and auxiliary audio input, Bluetooth and a navigation system. Sorry, Jaguar has yet to make the jump to smartphone compatibility with Apple CarPlay and Android Auto. Options include a 16-speaker Meridian audio system, a Wi-Fi hotspot and an upgraded navigation system with a 10.2-inch color display. 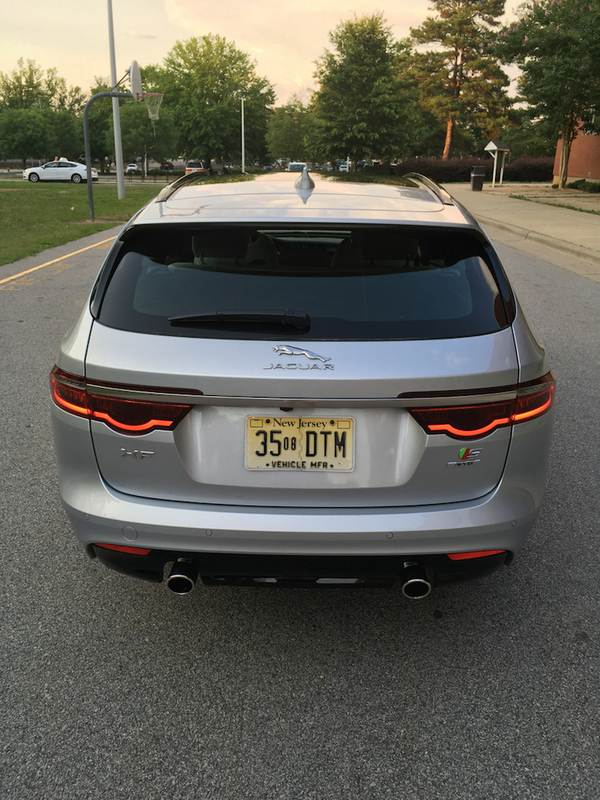 Under the hood of the 2018 XF Sportbrake is a 3.0-liter supercharged V6 engine with 380 horsepower and 332 pound-feet of torque. These numbers are familiar to the Jaguar faithful as they represent the enhanced horsepower figure for all “S” models along with the torque generated. The standard Jaguar models make 340 horsepower, but through engineering tweaking, 40 additional horses are brought to the gate. Jaguar marries this engine to an 8-speed automatic transmission with paddle shifters. With Jaguar electing to go with the enhanced engine and all-wheel drive, they are serving notice that this is a performance model. And that is something you realize the moment you start the engine, press on the gas pedal and head down the road. The exhaust system chimes in with a low hum, which is especially under full throttle. As for the all-wheel-drive system, it is rear-biased, therefore you enjoy the handling attributes that go with it. Steering is evenly weighted and the ride feels quite comfortable. Find your favorite twisty road and hang along the edge and you may forget you are driving a wagon. The self-leveling rear suspension helps, keeping the XF Sportbrake planted and focused. Although I have not driven either Jaguar SUV yet, I imagine that the body roll is noticeable with the crossovers, while it is absent with the XF. Credit the wagon’s 4.1-inch ground clearance for helping here. Move into the straightaways and you will soon see how fast this wagon moves. The ZF-supplied automatic transmission feels entirely comfortable, as it delivers the right cog for the moment. Grab your spouse and the kiddies, set the car seats in place and give everyone a driving experience that few utility vehicles can match. Allow me to admit my bias for a moment: I have grown weary of crossovers and I would love to see consumers head back to coupes and sedans. Americans rightfully turned their backs on the earlier wagons, given that the designs offered in the 1970s and 1980s were terrible. But what set our teeth on edge were models such as the Chevrolet Caprice wagon of the 1990s, which has bloated sheetmetal and garish “woodgrain” trim. Game over. Happily, manufacturers realize that style is extremely important. Wagons offer a challenging canvas, but through careful designing and attention to detail, the wow factor is possible. In the XF Sportbrake, Jaguar successfully crafted a look that is appealing. Moreover, it combines the utility of a crossover with the sportiness of a performance sedan. The high starting price point for the XF Sportbrake limits this model to a small audience. 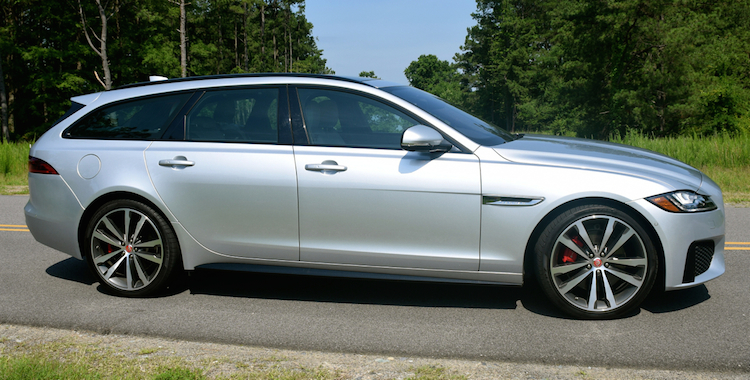 As long as Jaguar can internally justify limited sales, this wagon should enjoy a decent run. If it gains traction, look for more competitors to join in. Who knows? Any shift away from crossovers could benefit this once forgotten and long-neglected body style. 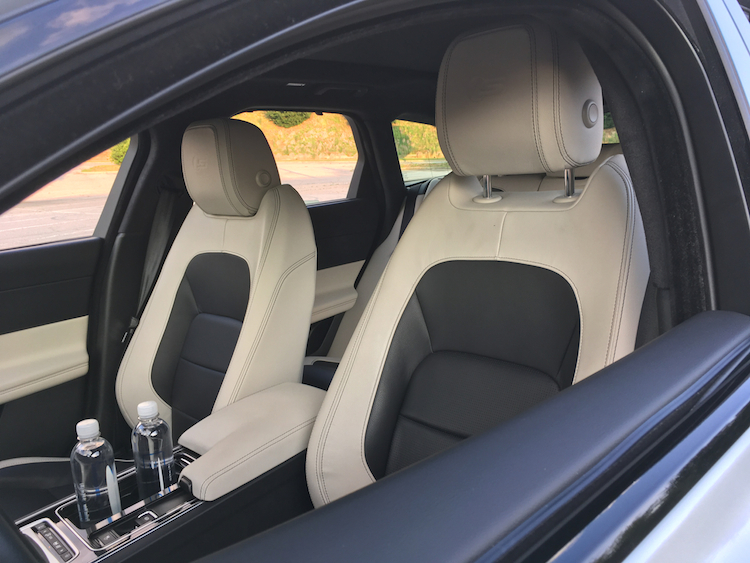 2018 Jaguar XF Sportbrake photos copyright Auto Trends Magazine. All rights reserved.